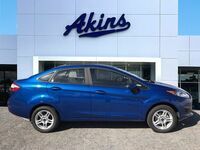 Ford’s nimblest and most fun to drive subcompact hatchback lineup is back and better than ever for the new model year in the form of the 2019 Ford Fiesta Hatchback lineup – and we’ve got it right here at Akins Ford near Atlanta, GA. The 2019 Ford Fiesta Hatchback lineup boasts a fewer number of trim levels this year, but all that means is that you’re getting more bang for your buck – as the two remaining trim levels for the 2019 model year are the 2019 Ford Fiesta SE Hatchback and the Ford Performance-inspired 2019 Ford Fiesta ST. And while the lineup cut back the fat in terms of its available trim levels, it did no such thing in terms of its standard and available features – as the 2019 Fiesta Hatchback lineup still features a comprehensive suite of advanced new safety, driver assistance, technology, connectivity, comfort and convenience systems. Since the 2019 Ford Fiesta Hatchback lineup features the Ford Performance built 2019 Fiesta ST, we know we’ve got to start our in-depth look at the lineup by checking out the ST’s impressive power ratings. The 2019 Ford Fiesta ST Hatchback is powered by a 1.6-liter 4-cylinder EcoBoost engine featuring 197 horsepower and 202 pound-feet of torque. This engine is mated to a six-speed manual transmission that helps it get up to 26 miles per gallon in the city and 33 miles per gallon on the highway. The 2019 Ford Fiesta SE Hatchback is powered by a 1.6-liter Ti-VCT inline 4-cylinder engine offering 120 horsepower and 112 pound-feet of torque. This engine mated to a standard five-speed manual transmission that helps it get up to 27 miles per gallon in the city and 35 miles per gallon on the highway. A PowerShift six-speed automatic transmission is also available for the 2019 Fiesta SE Hatchback. 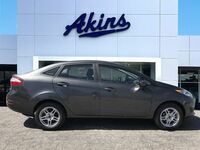 This transmission helps you get up to 27 miles per gallon in the city and 37 miles per gallon on the highway. In terms of interior space, the 2019 Fiesta SE Hatchback features 85.1 cubic-feet of passenger room and 14.9 cubic-feet of cargo space. The 2019 Fiesta ST Hatchback features 85.1 cubic-feet of passenger room and 10.1 cubic-feet of cargo space. 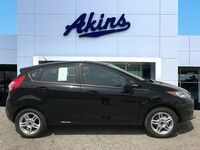 For more on the 2019 Ford Fiesta Hatchback lineup, don’t hesitate to reach out to our Akins Ford staff near Atlanta, GA.